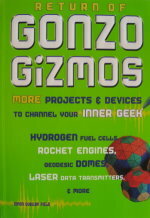 This toy is based on the simplest, most common object in the house that moves when heat is applied. It is an engine made from a thermometer. In this case, the thermometer is not the type with a liquid in a glass tube, but rather the dial type, where a needle moves like the hand of a clock across the numbers on the dial. The heart of this type of thermometer is something called a bimetal strip, which is simply two strips of different metals, bonded together. 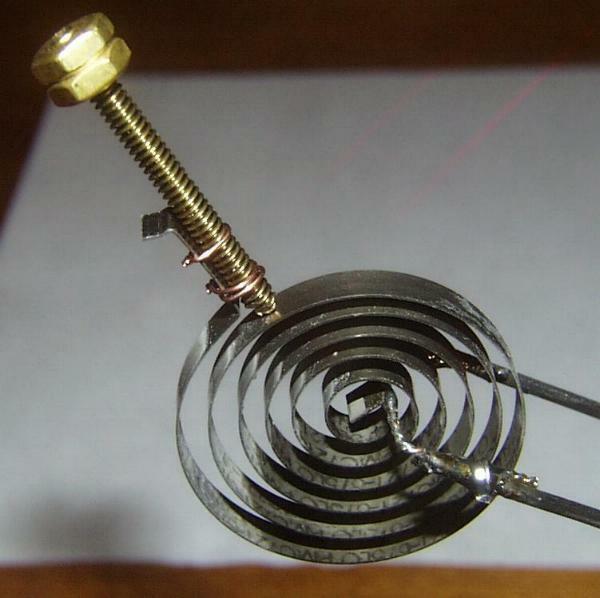 In the thermometer, the strip is wound up into a spiral, and the dial is attached to the center. 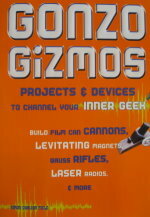 The concept behind the toy is very simple. Suppose we place a dial thermometer on a small teeter-totter. Then we put a weight on the end of the dial, and put another weight on the other end of the teeter-totter to almost balance it. If the thermometer is cold, the weight will lean towards the end of the teeter-totter (where the low numbers are on the dial). When this happens, the teeter-totter will be unbalanced, and the thermometer side will hit the ground. If the ground is hot, the dial will turn towards the higher numbers, carrying the weight towards the center of the teeter-totter. This shift in the balance will cause the teeter-totter to tip the other way, raising the thermometer off the hot ground, and up into the cooler air. As the thermometer cools, the weight shifts out again, and the whole process repeats itself, over and over again. In our heat engine, we use only the most important part of the thermometer, the bimetal strip. The first engine shown here uses a large coil from a big eight dollar thermometer I found at a local hardware store. The face of the dial was 12 inches across. The second engine is built from a smaller four dollar thermometer. The bimetal strip usually has one edge bent away from the coil to hold the coil in place in the thermometer. This makes a nice place to attach the weight. In our engines, the weight is a brass screw with a nut or two on it. The nut allows us to adjust the balance of the weight to make the engine run its best. We can move the nut up or down by simply turning it, which allows much finer adjustments than we actually need. While it is not necessary, I removed the head from the screw with a large pair of wire cutters, since the head isn't needed. 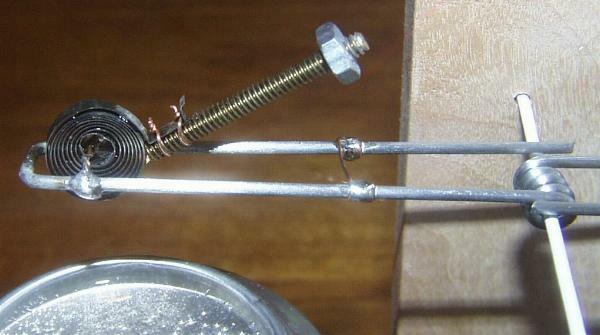 The screw is attached to the coil by two little pieces of copper wire, twisted tightly with a pair of pliers. 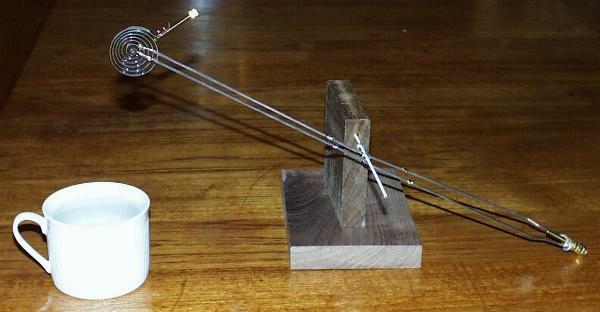 The center of the coil is attached to the teeter-totter with more copper wire. In this case, I put two pieces of wire (one on either side of the inside end of the strip) against the strip and twisted them tightly with pliers. I then soldered the twisted copper wires to hold them tight. The teeter-totter is made from a couple of coat hangers. The paint is sanded off the coat hanger wires (so they can be soldered), and the wires are bent around a nail in the center, to form a pivot. 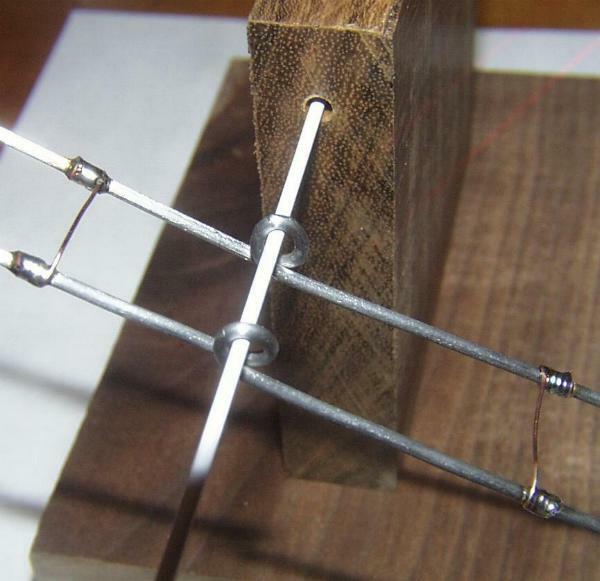 The wires from the center of the coil are soldered to the two coat hanger wires to complete the coil end of the teeter-totter. The weight should be pointing all the way to the outside of the teeter-totter (away from the pivot) when the thermometer is at room temperature. I then put a couple of coper wires across the coat hanger wires between the pivot and the ends, to make the assembly a little sturdier. They may not be necessary. The counterweight is another brass screw. In the first engine I attached it the hard way -- by soldering a nut to the coat hanger wires, and screwing the screw onto the nut. In the second engine, I attached the head of the screw to the coat hangers with some copper wire, then soldered the wire to the coathangers. 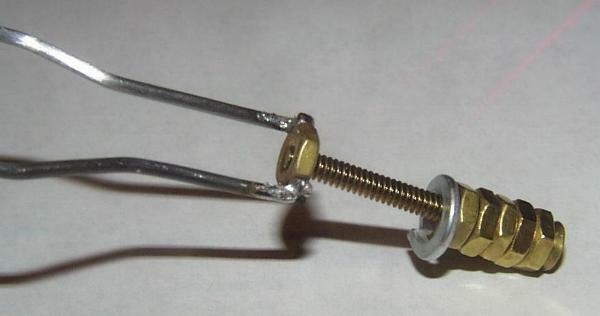 The nuts can then be easily screwed onto the other side of the screw. I recommend the second approach, it's much easier. 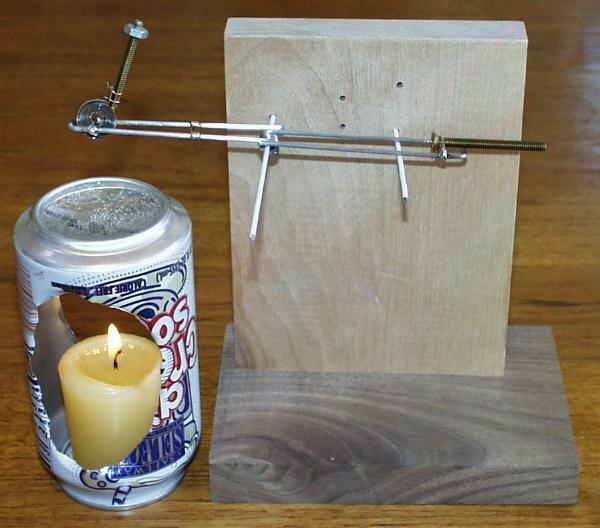 The pivot is simply a nail driven into a block of wood. In these engines I drilled holes in the wood and pushed pieces of coathanger wire into them, but a nail will work fine. One thing to note at this point: the coat hanger wires are bent slightly upward, to that the pivot is below the center of gravity of the teeter-totter. What this means is that if you held the whole thing up by the pivot, it would want to turn upside-down. It is supposed to be unstable, exactly the opposite of the kind of balance used to weight things. We will keep it from turning upside-down by holding it low, close to the table. This way one end or the other will usually be touching the table. To operate the engine, pour a cup of very hot tea (or just very hot water), and set the coil in the cup. It should quickly flip the weight towards the center of the teeter-totter. If it doesn't flip the weight, the weight may be too heavy, or located too far out on the screw. Make adjustments, such as screwing the nut closer to the coil, or removing a nut or two. You want as much weight as the coil can easily flip, placed as far from the coil as you can, while still allowing the coil to flip the weight. You may find it useful to put something under the counterweight, to keep it from going down too far. The coil is a spring, and when the teeter-totter brings the coil way up, the weight pushes on the spring hard enough that the coil may not be able to raise it back up. You can keep this from happening by not letting the coil rise very far. Some improvements in a smaller engine. To make sure that less expensive thermometers will work as the basis for the engine, I built a second engine using a smaller bimetal coil. At the same time, I incorporated some improvements I learned from working with the first engine. The second engine has a smaller teeter-totter. This is not because the coil is smaller. Instead, it is to make the movement of the weight have a greater effect on the balance of the teeter-totter. 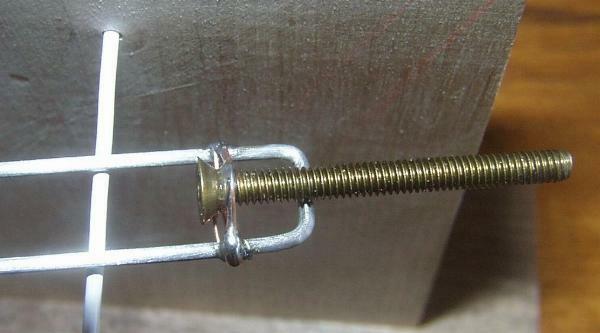 Ideally, a long plastic screw would probably be better than the brass screw as a holder for the weight. This would allow the screw to be long enough to hit the pivot (or even farther), making a much bigger unbalancing effect on the teeter-totter. However, I used what I had on hand. Making the teeter-totter smaller allowed me to make it out of a single piece of coathanger wire. This made the construction much easier, and the resulting assembly much more sturdy. I added a piece of copper wire to prevent the weight from travelling past the teeter-totter wires. I had found that if the water was very hot, sometimes the weight swung all the way around, and stopped the engine from working. As I already mentioned, I also found a much easier way to attach the counterbalance screw. Lastly, I added another wire coming from the block of wood to act as a stop for the teeter-totter, so it would not tip so far that the weight got stuck in the inside position. I also improved on the cup of tea. I had found that as the tea cooled, I had to keep adjusting the counterbalance weight to keep the engine working. In the new engine, I keep the water boiling by using a cut soda can and a candle. The water sits in the dent in the bottom of the upside-down soda can. There are two important principles in the operation of this engine. One isdifferential expansion and the other is hysteresis. 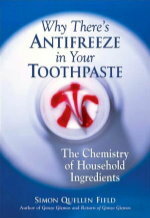 Most metals (and many other materials) expand when taken from room temperature to the temperature of boiling water. But each metal expands at a different rate. The bimetal strip in the thermometer is made up of two metals that have very different expansion rates. In the coil, the metal on the outside expands more quickly than the metal on the inside. 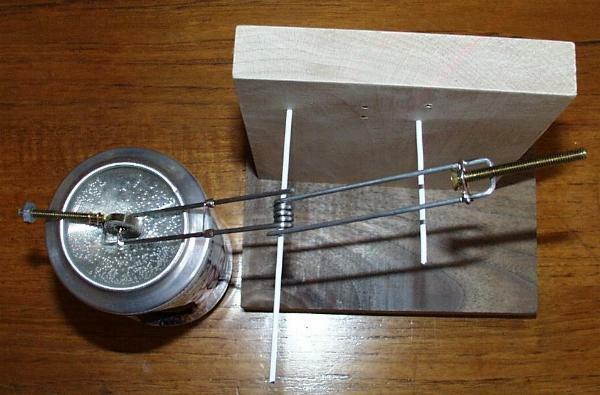 This causes the coil to curl up when it is heated. The heat energy in the hot water is converted into mechanical energy as the strip curls up. This mechanical energy is used to put the weight closer to the center of the teeter-totter, which is a change in potential energy. This potential energy is converted back into mechanical energy as the teeter-totter rocks away from the hot water. The second principle, hysteresis, is what keeps the engine from simply rising to a certain point and stopping, like a normal thermometer would do. As I mentioned earlier, the coil acts like a spring. This allows the weight to act against the curling of the coil when the coil is low, and then suddenly actwith the curling coil when the coil is high. The result is that the teeter-totter is more stable with one or the other end down, and is unstable in the in-between position. This tendency to quickly flip from one state to another is hysteresis. The engine is an example of abistable system, sometimes known as an astable oscillator.